Need guidance for inspecting a septic system? 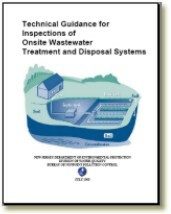 This document provides technical guidance for inspections of onsite wastewater treatment and disposal systems. It also includes discussion points on the evaluation of each component examined. By issuing this guidance, the DEP aims to provide consistent information to homeowners, buyers, interested parties and regulatory agencies. Having an unbiased and comprehensive evaluation of septic systems available, the DEP hopes to protect human health and the environment by encouraging homeowners to fix problems that may arise during a septic system inspection. This document was created by a committee of onsite wastewater professionals. This committee contained various representatives of the onsite wastewater industry, including the New Jersey Department of Environmental Protection, New Jersey licensed professional engineers, health department officials, inspectors, and septic pumpers. The Department welcomes suggestions for improving its technical guidance products.